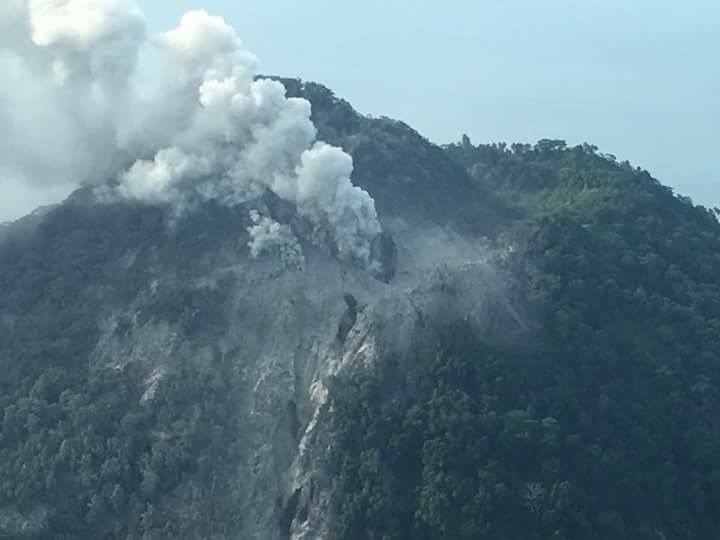 The current reports issued today by the PNG Rabaul Volcano Observatory of the Department of Mineral Policy & Geohazard Management on the Kadovar Volcano is that it is still erupting. The Main Crater produced weak to moderate grey ash clouds to 300 meters above the vent, at long intervals with stronger sustained explosive activity producing ash clouds to 500-800 meters above the summit and is being blown to the South and South West, towards the Sepik River. Whilst a Rabaul Volcano Observatory team was installing a seismometer on Kadovar they witnessed one moderate Vulcanian event with glowing rocks expelled. The South West and West Vents are both producing weak emissions but are often obscured by ash from the Main Crater. A moderate continuous white steam plume is rising from the South East Coastal Vent to 800 meters above the island. The South East Coastal Vent emits a steady red glow at night with some periods of fluctuating glow intensity. Downwind areas are affected by light haze. Discrete Vulcanian explosions will add pulses of higher ash loads and Seismometers have now been operating since 11:00 am (Local Time) on Blup Blup and at 15:00 pm (Local Time) since Tuesday on Kadovar. Between 11 am yesterday and 8:00 am this morning the Blup Blup seismometer recorded 6 discrete high frequency earthquakes and as for Kadovar earthquakes were at 2 seconds intervals from 14-15 km deep. The volcano is now being seismically monitored in almost real-time, if the situation escalates the number of earthquakes would be expected to increase in number and strength. The situation is also being monitored by various satellite techniques. The recording of high frequency earthquakes from Kadovar indicates ‘rock breaking events’ and indicates the structure is still being stressed and the situation is dynamic. The Risk level at the moment on the Island is HIGH. And on the Mainland and other nearby Islands, there is a small risk of TSUNAMIS happening.